Standing alongside the Pacific coastline of New Zealand’s east coast in the North Island, the Nautilus Napier is more than able to provide you with a luxurious and comfortable stay -- all topped off with 1930’s charm and oceanside rejuvenation. This 5-star rated apartment with fresh seafront views offers a range of rooms suitable for everyone from the executive traveller to the vacationing family. 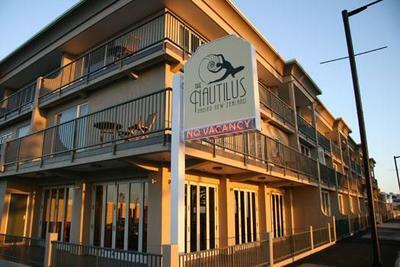 The Nautilus Napier offers sophisticated furnishing and all the modern conveniences of high-speed internet access, satellite television, room service, and an on-site restaurant dishing up Napier’s local produce and wine. Equipped with a proper kitchenette including a microwave, you would be at liberty to whip up your own meals or satisfy your late-night cravings. Private bathrooms are also fitted with spa bathtubs. That’s right -- jetted spa bathtubs. This 5-star rated serviced apartment is just minutes from the National Aquarium of New Zealand and Napier Beach where you just may pick yourself up a real nautilus shell. If you wish to move on from exploring marine wonders to mammalian curiosities, the Opossum World is a short distance away. Sporty folk can also head down to the nearby Nelson Park cricket ground. The Nautilus stands proudly in sync with the city’s distinctly modernist architecture, as Napier is known for its Art deco-inspired buildings, boasting the badge of honour for being New Zealand’s first nominated cultural location for UNESCO’s World Heritage Site. Soak in the city sights by grabbing a ride from Napier airport. Coming this December 2015, you can catch direct Jetstar flights to Napier from Auckland. Right in time for the Kiwi summer at the beautiful oceanfront getaway.